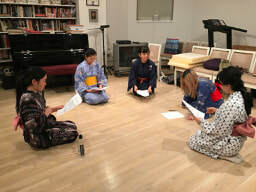 We have a workout session (meditation, stretch, voice, Japanese Dance and movement, and a play reading) on every Wednesday night from 6:00 - 8:00 (date and time might change sometime) at the Amaterasu Za studio in Tribeca. Please contact to info@amaterasuza.org If you would like to join us. Please bring a Yukata or Kimono if you have one, and Tabi or socks. Be prepared to remove your shoes. Space is limited, so please reserve your spot early. We will cast our productions out of the pool of actors that attend these workout sessions.